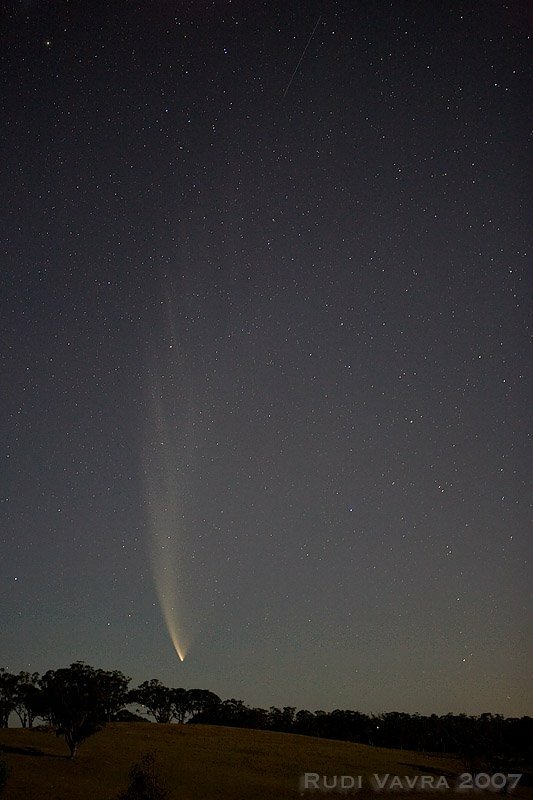 After two weeks of cloudy evenings, luck was finally with me. 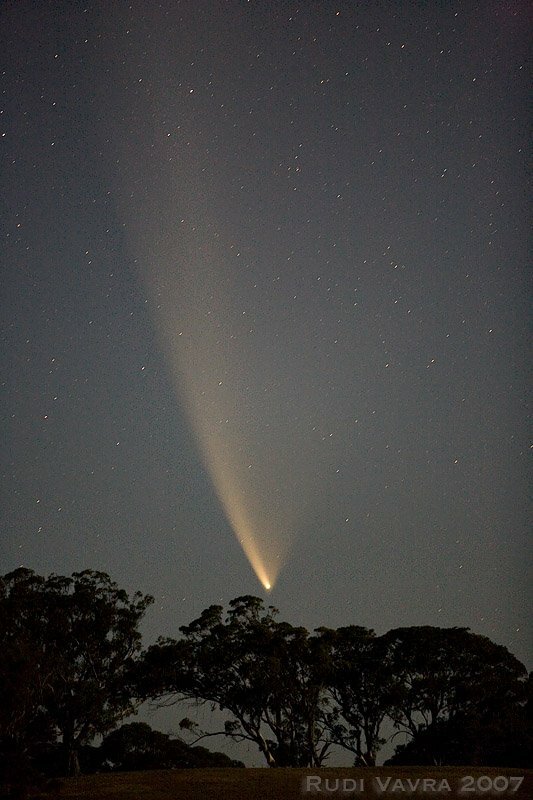 Photo details: Canon 20D, 70-200 mm lens @ 200mm, 4 sec exposure at f/5.6. 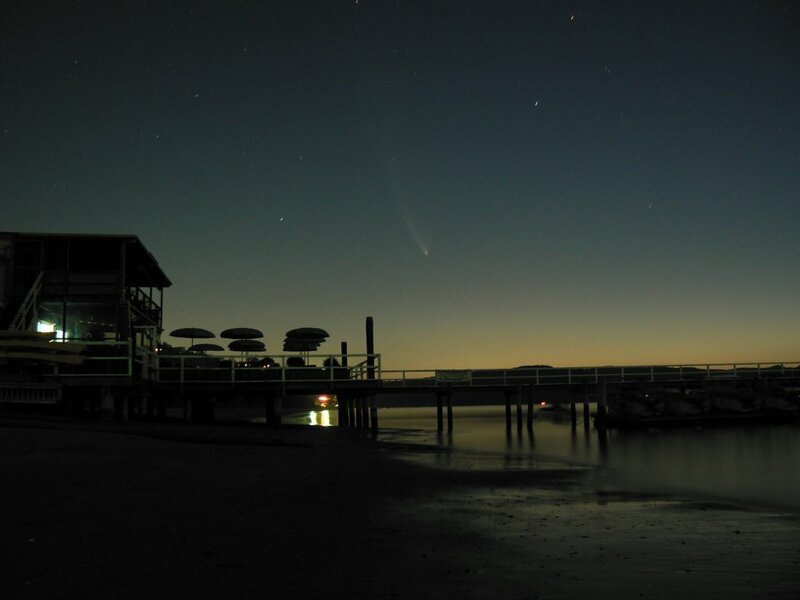 Taken at 21:49 NZ Daylight Time. Even with a 1st quarter moon around the tail could be seen out to 25 degrees, and this became 30 when the moon set. 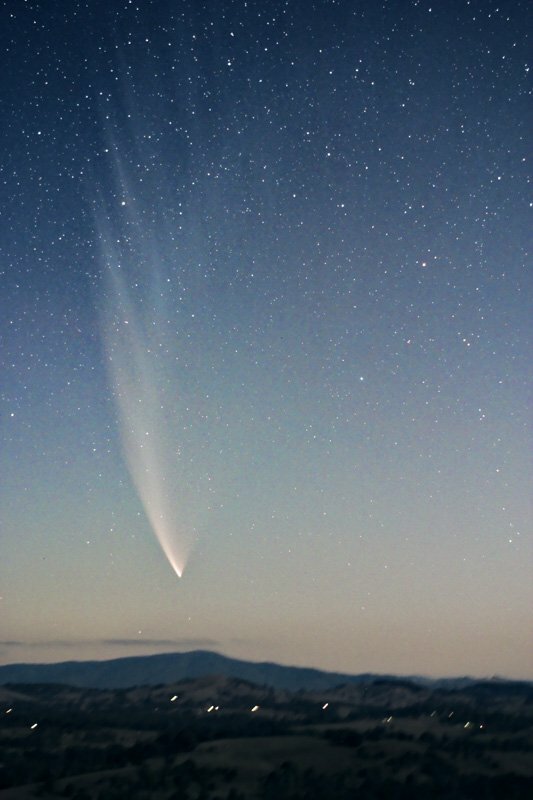 The magnitude of the coma was about +2.1, The overall appearance has gone from being a mirror image of Comet West to looking like Ikeya-Seki in reverse. Photo details: Nikon F camera, 50mm lens at f/2. 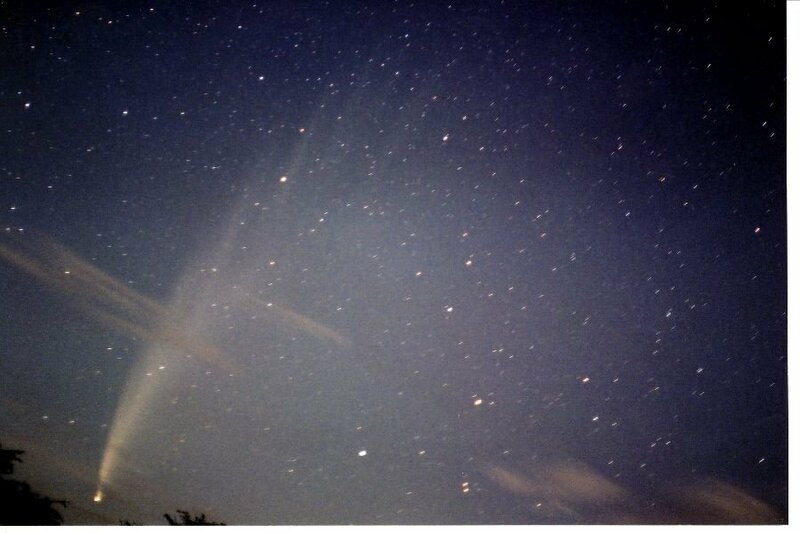 30 second exposures on Fuji Xtra 800 film. 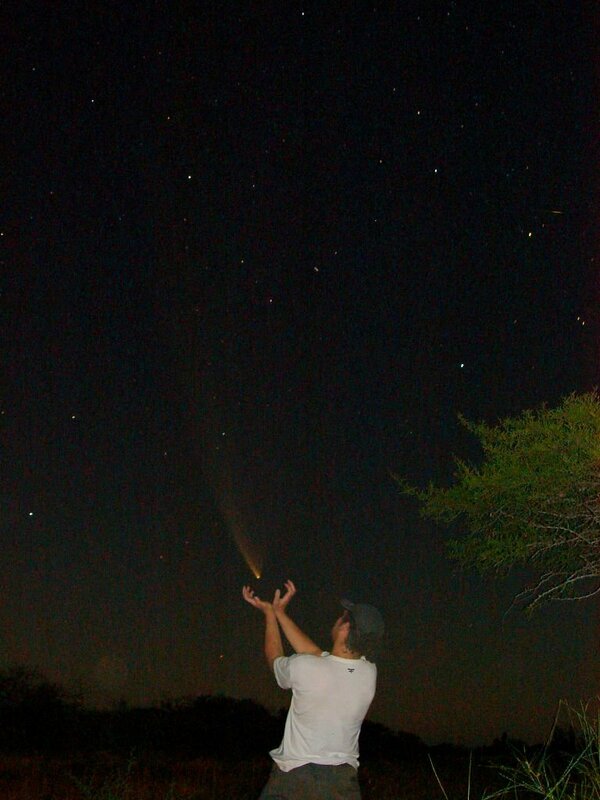 Atrapando el cometa para ti - 21:23 hs.! 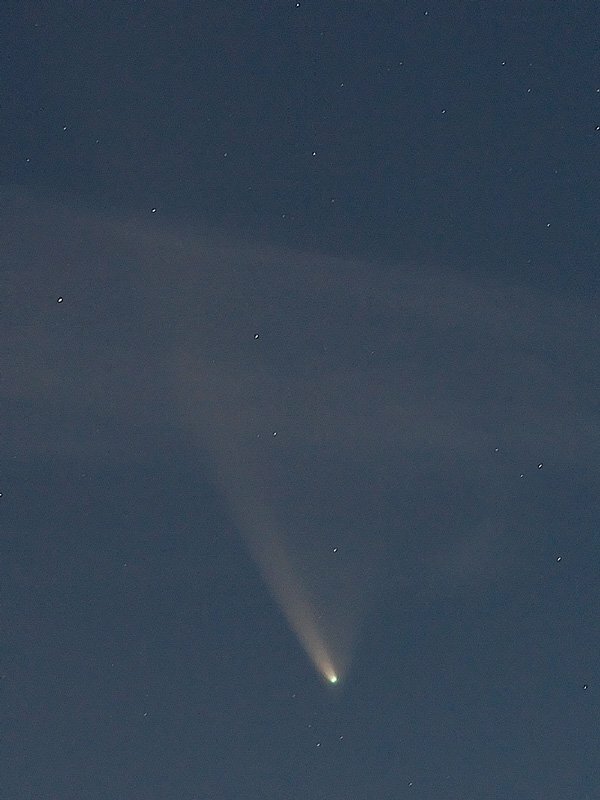 The moon was very bright tonight and we could see our shadows, but that didn't stop Comet McNaught, still an easy naked eye target. Photo details: Canon 20D, 18-55 mm lens, iso 1600. Photo details: Canon 300D, 80 second exposure (piggybacked on EQ mount), 35mm lens @ f/3.5 set to ISO 400. 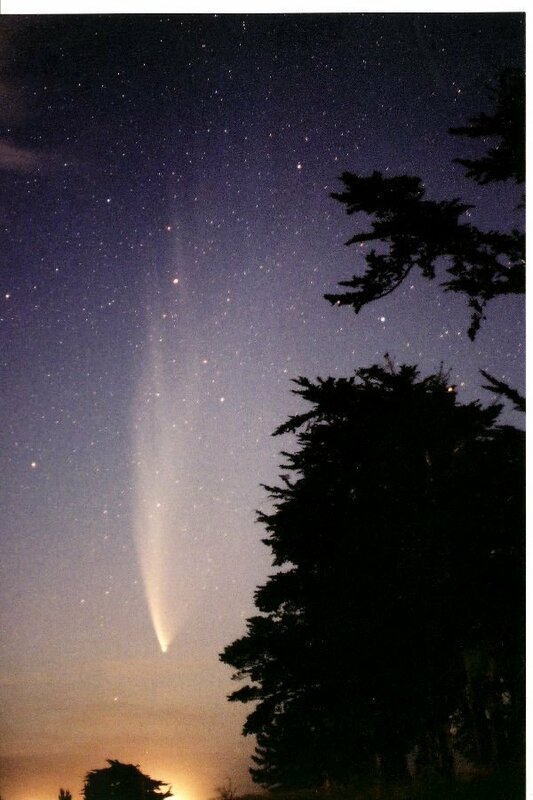 Comet McNaught does not seem to mind the moonlight too much. 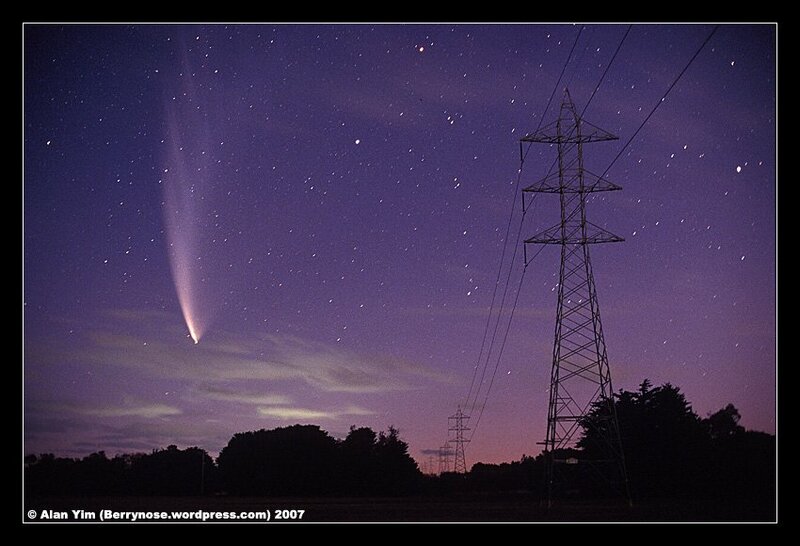 It is still a strikingly beautiful comet with a tail that easily spans over 20 degrees, even in these conditions. Photo details: Canon EOS 5D, 24mm lens, f/2.8, ISO 1600, 30 sec. 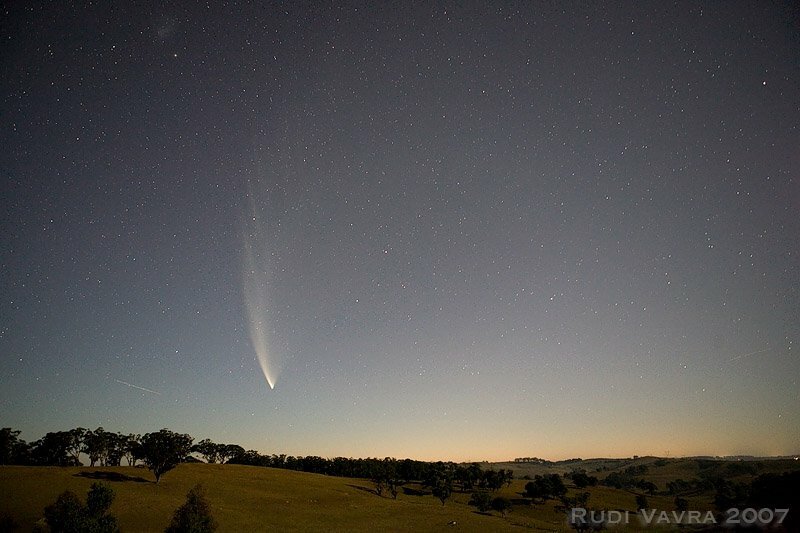 Comet McNaught is still putting on a great show, evan under a 57% moonlit night. 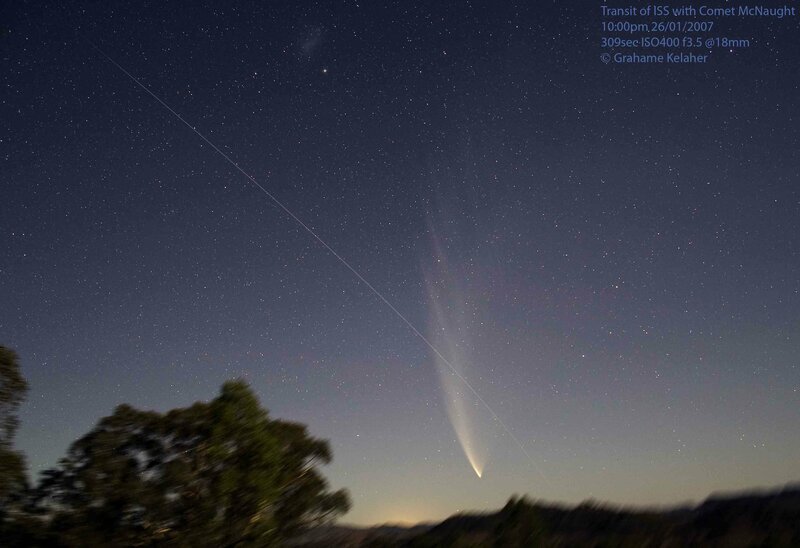 This shot has the International Space Station transiting and the small Magellenic cloud visible. 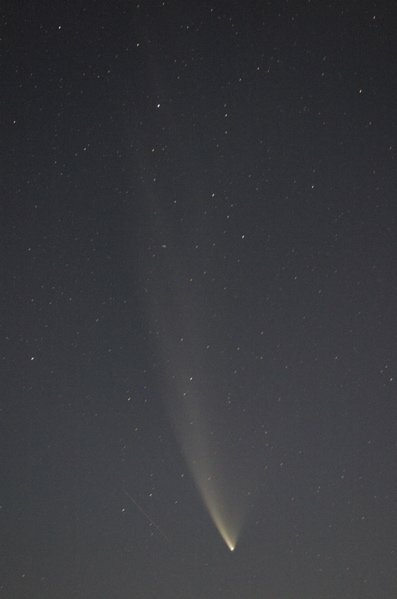 Photo details: Canon 20D, ISO400, f3.5, 309 seconds. Cape Bridgewater, west of Portland Victoria, Australia. Photo details: Canon 5D, Hutech modded, 50mm lens, f/1.4 @1.4, 13 second exposure at ISO 3200. 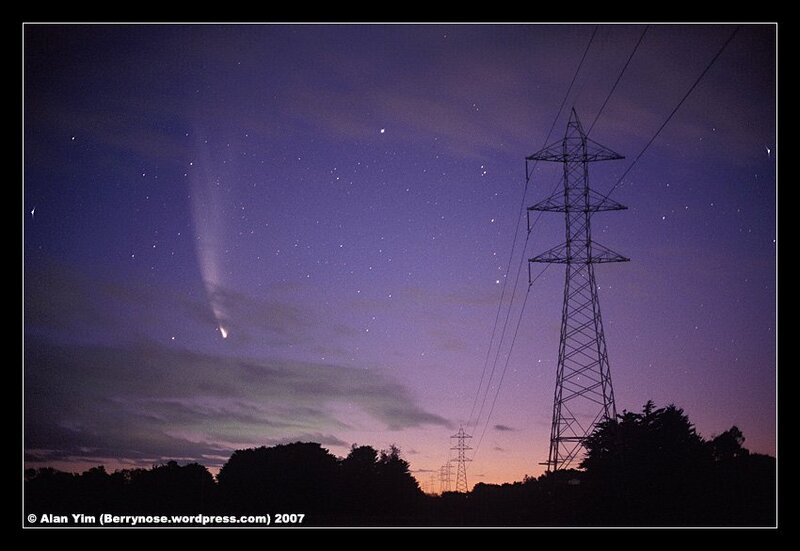 Comet by the power transmission lines. 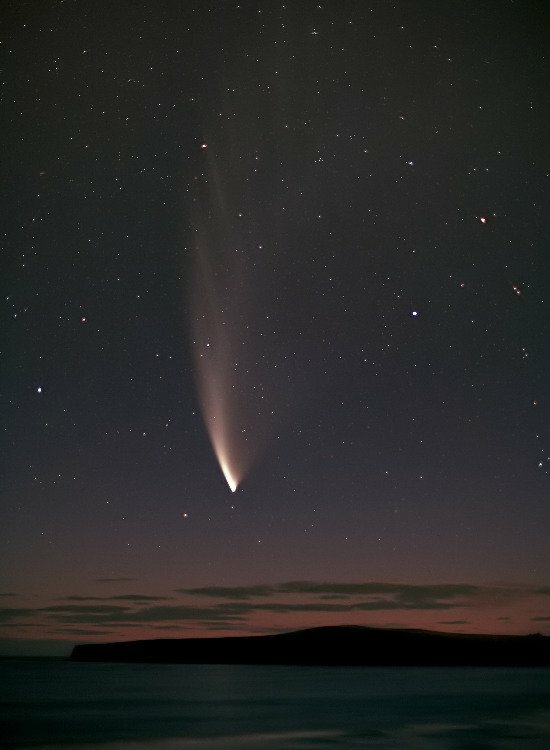 The sky was lit by the quarter moon that was probably the reason why a large part of the comet's dust tail faded away.